Thanks to the proliferation of smartphones, crazy antics caught on camera are a dime a dozen today. People do dumb things, and will continue to dumb things only now we have the technology to capture those dumb things and post them to the internet for the world to see. It’s America’s Funniest Home Videos 24 hours a day, seven days a week if you know where to look online. Somethings, though, those dumb things get picked up by local news stations, which only amplify our most embarrassing acts. The video above of a person nonchalantly transporting a horse in the back of a Chevrolet Silverado is up there in dumb things caught on video. The story behind the horse in the bed of the Chevrolet is strange. For some reason, the person had to get the horse to his work. However, the truck he uses to tow the horse trailer wouldn’t start, so the person opted to put the horse in the bed of the dinged-up Chevrolet Silverado and go about his business. Police obviously pulled him over, but let him go on his way. 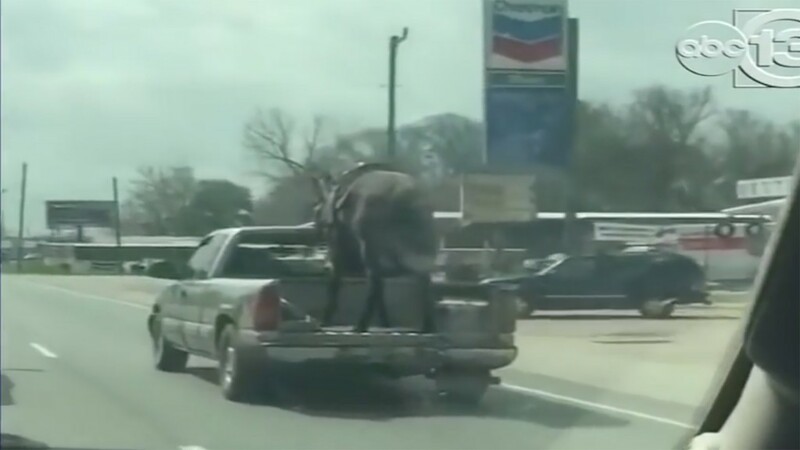 Apparently, in Texas, it’s not illegal to transport a horse in the back of a pickup truck. However, anyone under the age of 18 cannot ride back there with the horse. Obviously, the video has caused a stir among equine lovers even though it appears the horse is enjoying the breeze. Then again, it’s never good to personify an animal. For all we know, the horse could be petrified, especially traveling at 70-mile-per-hour highway speeds near Houston. Thankfully, the horse was uninjured from during the transport. The video is evidence that sometimes you have to do what you have to do, like getting a horse to your place of employment. However, you can bet your last dollar if you do something out there like this, someone will capture it on video. That’s just the world we live in today.